Three flying birds... one for each member of the family I left behind. 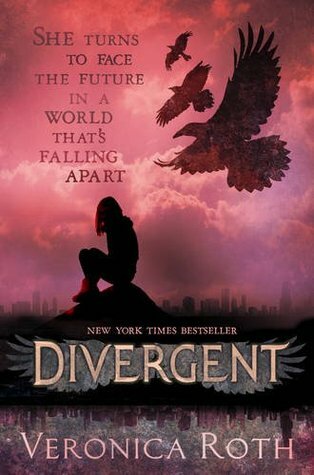 Sixteen-year-old Tris is forced to make a terrible choice. In a society where everyone must conform, Tris does not fit. So she ventures out alone, determined to discover where she truly belongs. Shocked by her brutal new life, Tris can trust no one. And yet she is drawn to a boy who seems to both threaten and protect her. The hardest choice lies ahead. You have no idea how long I've had my eye on this book. I'd log onto Amazon and then search the book and just stare at it, wondering when I was finally going to get the chance to read it. Luckily, I did well in some exams (as in, *cough, cough* got 100% but I'm not going to brag or anything...) and so I was finally allowed to buy some new books. It was a tough choice between certain reads, but I chose Divergent and Insurgent - and I am so glad I did. I have this really big sense of OCD when it comes to paperback books. Reading it on Kindle is just not the same. Plus, this one's kind of lengthy than normal YA books, and I don't think I possess the patience to read a book like that without holding the actual thing in my hand. Anyway, enough about me - time to get onto Divergent. In Beatrice Prior's world, her society is split into factions. Factions are like family, in fact, they're meant to be valued higher than a family. A faction is where you'll find a career and become and adult. However to do that, every sixteen-year-old must choose which faction they belong to. There's the Erudite (who value knowledge), Candor (honesty), Amity (peace), Abnegation (selflessness) and the most daring, Dauntless - who value courage and bravery. Born into a family of Abnegation, Beatrice doesn't believe she belongs. So she has a choice. Either stay with her family, in a faction which she feels she can never be a part of, or join the Dauntless, the faction which she is strangely fascinated by, ultimately transforming herself into the undaunted Tris. I was promised big, big things with this book, and I wasn't disappointed. Tris is a character that I admire; she does things that I can only dream of doing. Veronica Roth doesn't describe her as particularly attractive, but it's her venturesome behavior which forces all eyes on her. I adored how much she progressed as a person throughout Divergent, and it made me wonder what really effects us - it had me linking back to the whole nature vs. nurture theme. Quite frankly, I don't really like dystopian novels.They seem too... detached. I find it really hard to imagine alternative futures like they present. That's not the case with Divergent, though. The further I read, the further I fell for the dystopian genre. Personally, I think Divergent is kind of like a mixture of The Host by Stephanie Meyer (one of my favourite stand-alone novels) and The Hunger Games. I'm obsessed with both of them, so you can imagine how emotionally attatched I am to Divergent. I'd find myself reading it till very late and then waking up at a ridiculously early time, just to start reading it again. It was nearly impossible for me to stop wondering what was going to happen next. I also now have a new favourite number - four. Now I'm definitely going to give dystopian novels a go. For me, this book was perfect. Why didn't I start it earlier? 5/5 stars - Outstanding. There should be a sixth star or something.